Ever since the flagship store opened in December last year I have been itching to go! I know it is a little sad, but come on it is their only stand-alone store globally and it's my favourite brand by far! Just look at how pretty the whole store is from the dollhouse till to the peach stand. This has got to be the focal point for the entire store, I cannot imagine any girl that doesn't want a dollhouse just like this all of her own. With the Too Faced goodies included of course, here you can find the mini's as well as their new exclusive pearl necklace. I especially loved the set up for all the lippies, after all, that is my signature piece these days. You can also get the new Peaches & Cream collection in the store, which has been displayed in a giant peach. I was finally able to have a look at the Peach Blur, which is the compact finishing powder of the Peaches & Cream range. I use the Peach Perfect Setting Powder, so when I tried the Peach Blur it really made no difference at all. It was a little disappointing because I was looking for a compact version of the loose setting powder, however, I am glad that I waited till I actually tried it in store. Another item from the Peaches & Cream range I was dying to try was the cream to powder blushers, I mean it is a strange concept to get your head around. Honestly, though, they did exactly as described and I was gobsmacked. Life's a Festival was also in store, I had been intrigued to try out the Magic Crystal Lip Topper. Having already had a dark shade of Melted Matte on, I tried out Unicorn Tears over the top and it created such a beautiful look. The only downside is that it is a little sticky and does make the Melted Mattes not last as long as they usually do. I obviously had to get a picture on the minibus, I would love a back wall just like this one! Needless to say, I did leave the shop with a mini haul. I have been using the setting spray for quite some time now and have to say it is incredible, I was just in need of a new one. I did get one blusher in So Peachy and had to purchase the Unicorn Tears Lip Topper obviously, I also re-purchased a sketch liner as these are so pigmented. 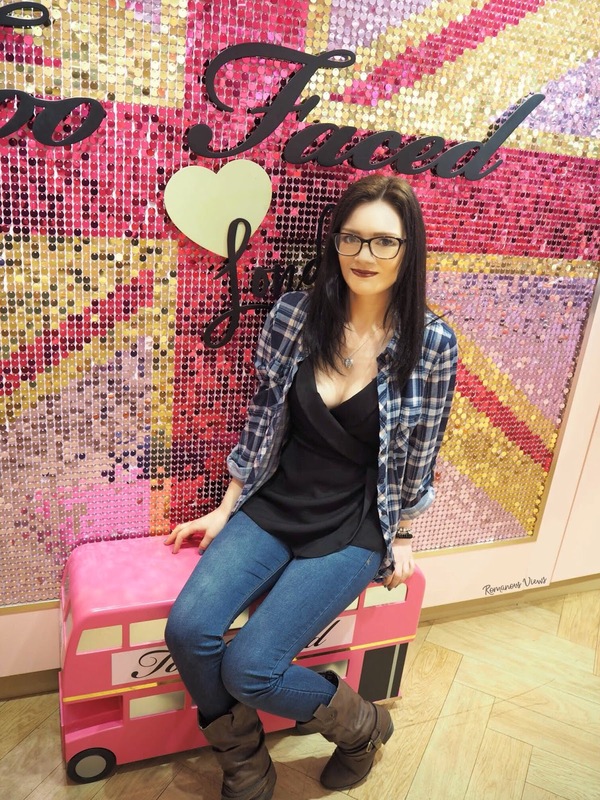 Have you been to the Too Faced store? What did you think? Oh Wow! I've never been to a Too Faced store before but I think I might have to find an excuse to go! Haha, it looks beautiful!